D-Block: rehearsal/practice rooms, lab and studios for music and media students. Studio A, B and D (limited to eligible music production students). Media Kits: video and audio kits for media students. Epson Printers: Medium & Large format printers. Concert Stage Plans: Create stage plans for D1.29 Concert. You don't register to make stage plans. Each stage plan can have its own email and password. To make a booking you must first register (links left and below) with each individual booking calendar relevant to your study unit. You only have to register once, after which you login to make bookings. Some rooms and equipment require being enrolled in the relevant units for access. Each time you make a booking you are required to confirm that you have read the Procedural document (in forms and documents) and the emergency assembly areas. In the case of an emergency staff and students are required to assemble in specific areas depending on their location. The D and V block assembly areas are located accross the road on the eastern side of each building. 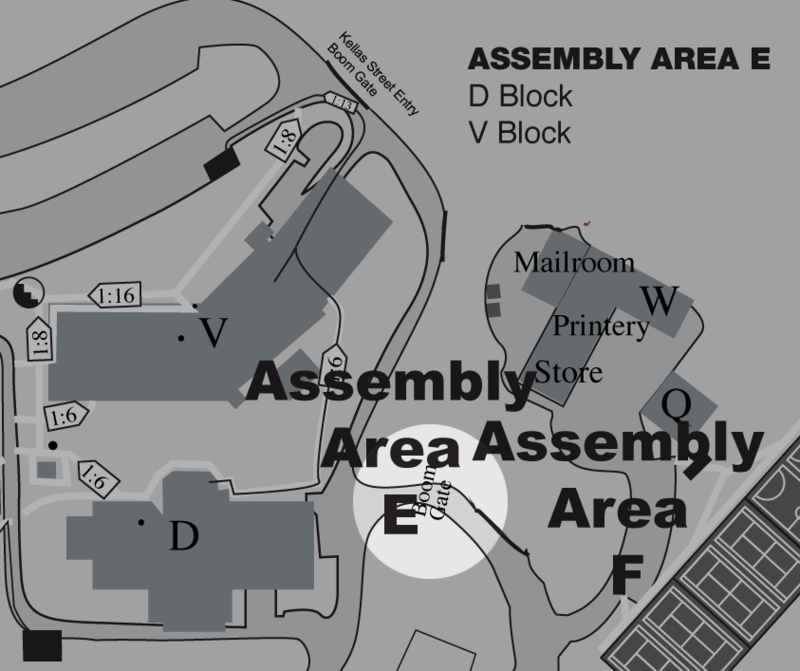 Click Here to view the Emergency Assembly Area map for D and V block. Download PDF version (PDF 420kb). D-Block Fault Report Form (click to open) username password required, use the same user/pass to get access to bookings stageplan etc.